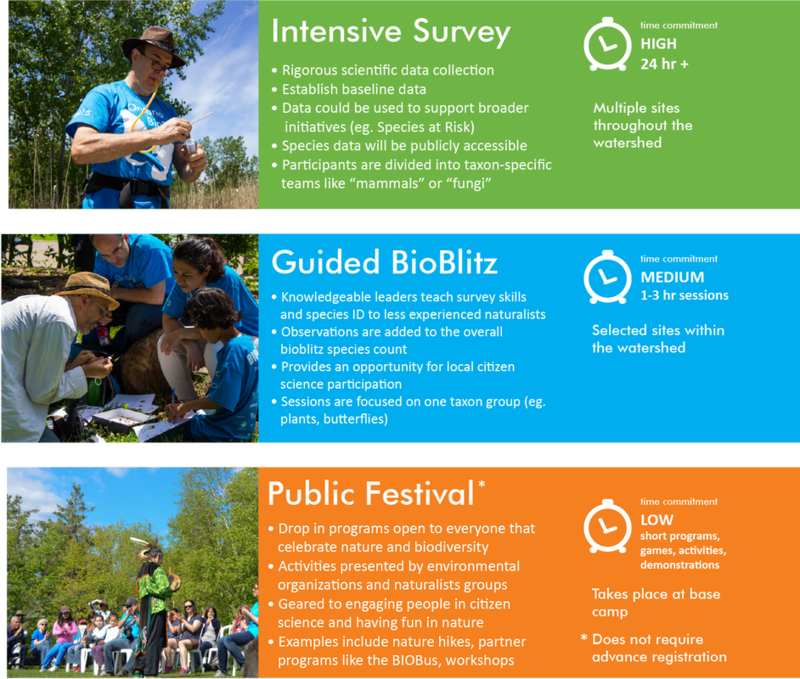 Each of our flagship Ontario BioBlitz events has an army of volunteers and participants who help make the Blitz happen. Below is an infographic that breaks down the three different levels or components of participation. Below that is a detailed breakdown of roles within the Intensive Survey and Guided Blitz, as well as a description of our BioBlitz Support team. Level of Expertise – High level of knowledge of one or more taxonomic groups. Skills required – a solid working knowledge of the taxonomic group with years of experience in surveying, collecting (if appropriate) and identification. Level of Expertise – Intermediate level of knowledge of a taxonomic group. Upper level university students and experienced or intermediate level naturalists would fit into this category. Skills required – some knowledge of the taxonomic group with some experience in surveying and identification in field or lab, or experience using field guides. Enthusiasm and willingness to help out are important here. Level of Expertise – General knowledge of natural history or ecology and/or some expertise in a taxon group. Skills required – Previous experience leading nature walks required. Experience working with the general public including children. Familiarity with site(s) would be useful. Time commitment – as required by schedule. NOTE: Experienced naturalists with time constraints that prevent them from committing to the entire weekend are encouraged to register in this category. Description – these individuals like nature and want to learn more about bioblitzing and to gain some survey and identification skills. Skills required – enthusiasm and willingness to learn, minimal prior knowledge necessary. Time commitment – as desired – there will be different sessions spread across Saturday and Sunday. Description – for young people who want to learn more about nature and bioblitzing. Must be accompanied by an adult. Time commitment – as desired. It takes a lot of people behind the scenes to run a Bioblitz! The program would not function without the dedication and hard work of our volunteers. Description – general support, may help with anything from serving food to running between locations, to registering participants on the day. Description – these individuals will help with the Base Camp Festival and educational activities that will take place around the BioBlitz Base Camp. Description – these individuals will help Guided Blitz leaders with check-in and registration for the Guided Blitz sessions. Facilitate Guided Blitz check-in by ensuring all names are checked off the list for each session - even if participants have already registered earlier in the day. Description – these volunteers will help BioBlitzers to begin their camping setup, and watch over the camp site during the event, as the camp site is publicly accessible. Oversee and secure tents and equipment at the overnight camp site, "Tent City"